Location: Moraine Hills State Park, At Moraine Hills State Park on east side of Fox River below State Route 60. Moraine Hills (State Park) Trail, managed by the Illinois Department of Natural Resources, is located in the northeast corner of Illinois, 3 miles south of the City of McHenry. Total trail mileage is 10.2, 8.5 crushed limestone loop with the following segments: The 2.0 Fox River, 3.2 Leatherleaf Bog, 3.7 mile Lake Defiance and 1.7 mile linear paved River Road. Trail use consist of cycling, mountain biking, hiking, jogging, and cross-country skiing. Moraine Hills (State Parks) broad trail swerve in and out marshland and up and down kettle moraines, near natural lakes, prairies, bogs, wooded hills and streams. More than 10 miles of trail make Moraine Hills popular for hikers, skiers and cyclists. Four trail segments, three surfaced with crushed limestone and one with asphalt paving wing their way through the park and offer exceptional views of the 48 acre glacier Lake Defiance, 115 acre Pike Marsh, home to many rare plants and 120 area region known as Leatherleaf Bog, an example of kettle-moraine topography. The trail also offers a close-up view and experience of the historic Fox River and McHenry Dam on the park's western border. 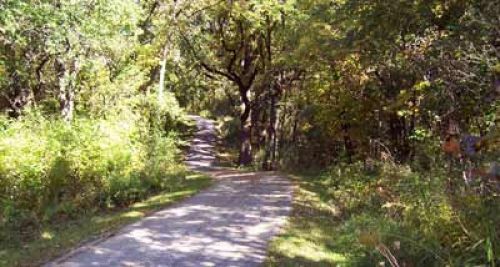 The park's 11.7 mile linear asphalt trail along River Road connects to the 450 mile Grand Illinois Trail connecting many communities from Lake Michigan to the Mississippi River.